This is an all metal hotend upgrade kit for MK10 style extruders. Thermal barrier tube is made from 2 different materials. The lower thermal break is made from stainless steel, and the colder upper part is made from aluminum. Stainless steel was used for thermal break because it offers low thermal conductivity, and aluminum was used for the upper portion because it has a lot better thermal conductivity, to carry away any heat from the filament. All metal hotend will let you print at much higher temperature than possible with original PTFE lined one. Another benefit of an all metal hotend design is more consistent melt chamber control. During slow extrusion rate, in PTFE lined hotend, transition zone from solid to molten plastic tends to creep upward creating more stringy prints. With all metal design a transition zone is always constant, being located right at the heat break. With fast extrusion rate, PTFE tube doesn't have enough thermal conductivity to properly melt all the plastic coming out. On MK10 extruders that limitation happens around 60 mm/s, depending on nozzle size. All metal hotend solves this problem, plastic is surrounded by thermally conductive nozzle throughout its length. High quality, Ensure Concentricity and Roundness. Very easy to upgrade for MK10 Hotend Exturders. 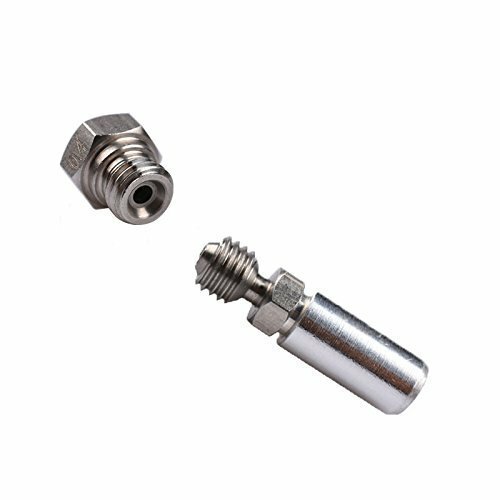 Nozzle is Stainless steel 0.4mm. Fit for filament size:1.75mm filament. Upgrade for CTC / Wanhao D4&i3&4S&4X / FlashForge / Creator pro / Dreamer / Finder / Guider / Dremel Idea Builder / Builder PowerSpec 3D / Pro PowerSpec 3D X Etc.